Oh my. You guys. This soup is a game changer. You may develop an addiction to truffle salt that is unstoppable. Don’t say I didn’t warn you! You may want to eat truffled soup every day for the rest of your life. Or sprinkle truffle salt on your french fries, popcorn, soups, stews, steaks & roasted veggies. 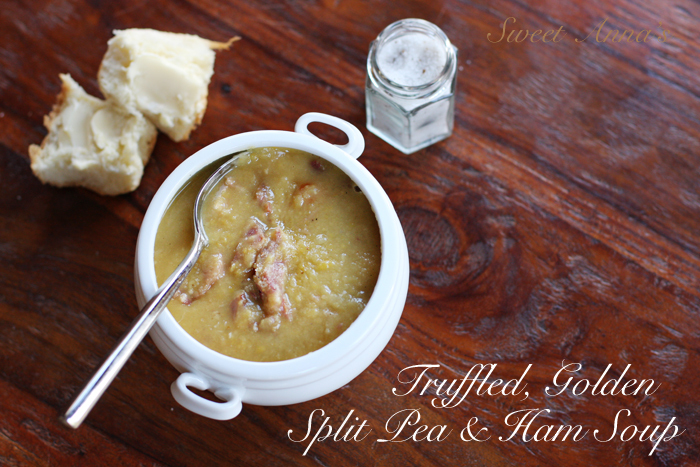 Split Pea & Ham Soup has always been one of my favorite things ever. But then this. If you’ve never tried truffles before, now is the time. If, like me, you have been eyeing truffle oils and truffle salts lately, but haven’t been sure how you would use them… this is the start. If you aren’t sure you’ll like truffles, try this anyways. You will probably surprise yourself. And if your family is like mine (full of picky eaters!) they will even love it too! So, go get some truffle salt (it’s a bit of a splurge, but will last you a long time and WORTH it!). Make this soup. Have a second bowl, and maybe hide the leftovers. It’s that good. Happy almost New Year, friends! Here’s to a healthier start of 2014!! Heat the oil in a large stockpot over medium-high heat until the pot is nice and hot. Sauté the onion, carrots and celery until softened, about 5-10 minutes. Stir in the minced garlic and cook for about a minute, until very fragrant. Nestle the ham hock into the pot and then pour the chicken stock in (and enough water, if needed, to cover the ham hock). Stir in the chipotle powder and salt & pepper, bring to a boil and then reduce the heat to low, cover and simmer for 2-3 hours. Stir in the dried split peas and bring the soup back up to a boil. Reduce the heat to low again and simmer, with the lid off, until the split peas are soft and broken down, at least 1 hour. 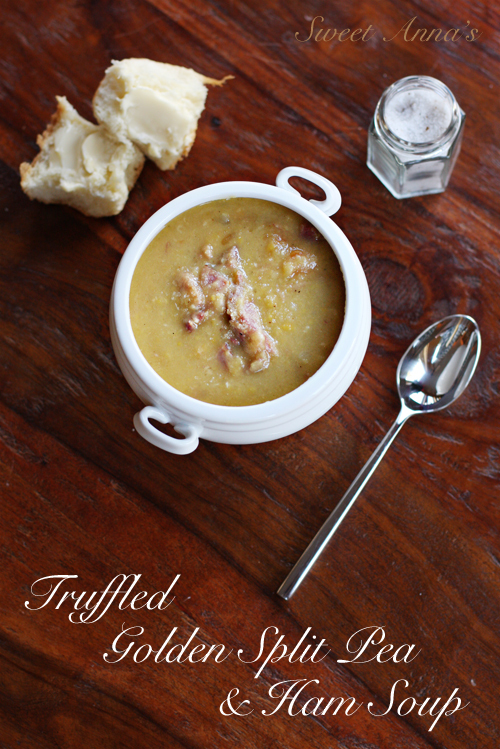 When you serve the soup, sprinkle each bowl with truffle salt, or a drizzle of truffle oil. Let each person enjoy the aroma that fills their senses and then stir the salt or oil into the soup as they eat.